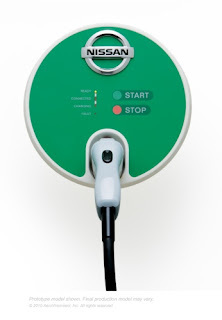 AeroVironment recently partnered with Nissan to supply and install home chargers for customers that purchase the Leaf. To install these things on a nationwide basis, AeroVironment plans to partner, train, and certify with electrical contractors so they know how to properly install and maintain them. From looking at their careers page, they are preparing for this program now. Electrical contracting companies wanting to enter the EV charge market should probably contact them soon to see about entering this program. The "filler hose" thingy (see picture at right) that will be on the end of most charging stations was finally approved by the Society of Automobile Engineers (SAE)! This device will make it simple and especially safer for you to charge your new electric vehicle. 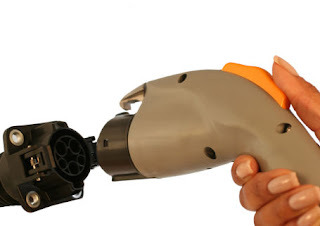 This is a very important step the evolution of Electric Vehicles as this will be the standard connector that new vehicles will use. Today, each manufacturer uses the plug system that they think is best, but that is not best for us (the user). Just think if you had to search for a gas station that supported your car! The J1772 standard was developed by the SAE Hybrid J1772 Task Force in cooperation with major automotive OEMs and suppliers, charging equipment manufacturers, national labs, utility companies, universities and standards organizations from North America, Europe and Asia, so it's been vetted by stakeholders worldwide. Here's a spreadsheet that I created to do some rough calculations on Electric Vehicle charging, like finding the cost to charge, watts per mile, and the range per hour of charge. Simply enter the Range (miles) and Battery Capacity (kW/h) of the car you want to solve for in the Yellow cells and see the resulting calcs. Feel free to change the assumptions such as energy cost, charge voltage and charge amperage too. What this calculator doesn't do is account for the capacity that an automaker might be guarding to protect the battery. For instance, even though a battery has a given capacity, the automaker may not allow the entire capacity to be used in order to protect the batteries from damage via over-discharge. If you find errors or have suggestions, please let me know! If you save the spreadsheet as an Excel Spreadsheet, you will be able to see the formulas that I used. The Nissan Leaf and Chevy Volt only charges at 3.3kW/h at Level 2 (220V), so you need to enter 15A for the charging current to see more accurate estimates. The Coda Sedan charges at 6.6 kW/h, so you would enter 30A for the charging current. The Chevy Volt has a 16 kW/h battery, but limits the use (via software) between 30% and 85% of capacity to prolong battery life. Therefore you should figure to recharge only 8.8 kW/h. Love the acceleration of a very quick roller coaster launch, like Polterguiest or The Increadable Hulk? Like a car that listens intently for your actions and responds instantly to them? Appreciate ultra-light cutting edge materials and being able to lift your hood with your pinky? 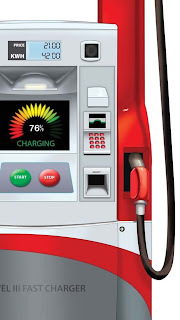 Love the idea of filling up your car with clean electricity vs. dirty petroleum? Then you'll LOVE the Tesla Roadster...I certainly did! More than 200 miles on a charge! Instant, smooth, silent, linear, and strong power...simply breathtaking! Lifting the accelerator slows the car quickly...like you are in a lower gear. The best part is that the braking energy goes back into your batteries vs. wasted as heat...and this means less brake maintenance! Regenerative braking rocks! Go-cart like handling. If this car had power-steering, one good sneeze could equal a lane change. Hand-built and unique feeling to the car. The cockpit was well laid out and had good "character"
Not easy to get into or out of if you're tall. Although I was comfortable when I got in, it's not easy getting my long legs into the car (I'm 6"2"). Your "significant other" probably won't like being a copilot often since it's work to get in it "gracefully". Since the Roadster doesn't have power steering, you have to use some elbow grease to get it to turn...but you get used to it quickly. The heated seats needed a turbo button. Heating your body with the seats is more efficient than heating the cockpit...and easier on the battery life. Not impressed with the user interface for the onboard computer, but Tesla probably knows this based on the improvements they're putting in the "S". Slow Charge: The base Tesla only ships with a 110v charge cable, which will fully charge the car in about 24h. You could probably get away with primarily using this if you just used the car daily for short drives (<50m) and only had to top off the Roadster's charge each night. Medium Charge: If you wanted to fully charge the Roadster in about 8 hours, you could purchase their Mobile Charger for $1000 and plug it into a 240v Dryer outlet. 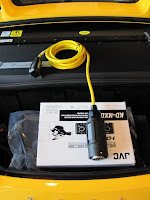 This is the charging method of choice for cross country travel with your Roadster. 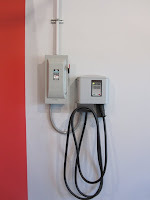 Fast Charge: If you want to fully charge your Roadster in 3.5 hours, then you'll need to pony up for the $3,000 fast charger from Tesla and then pay an electrician to plumb it a 240V/100A circuit to feed it...which could be expensive ($500+) since that's a lot of electrons and most homes only have a 200A service to start with. Here's a video of what it's like to be in the Roadster during a drive...including what it sounds like. In addition to a 0-60 run, I got to overtake other cars twice, so you can get an idea of how quickly it accelerates...and how quickly it slows down. 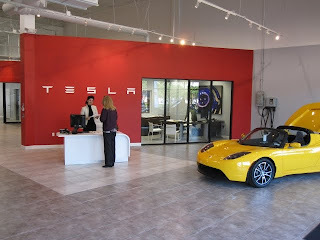 Thanks to the crew at Tesla South Florida for the hospitality and test drive! Much has happened over the past two months since I presented at the Renewable Energy Expo. In addition to presenting to other groups, consulting with business to help them create their GTM strategy on Infrastructure, and networking with other experts, I am also a proud member of the steering committee for "Get Ready Central Florida", a soon-to-be partner city of RMI's Project Get Ready. Our "Get Ready" team consist of people from Orange County government, City of Orlando, OUC, Progress Energy, and yours truly. Over the next few months, we'll be educating Central Florida businesses and governments on what EV Infrastructure is, where it's going, and how they can participate. We've got our goals done, working groups defined, and our kick off event roughed out. We're also meeting with auto manufacturers that will be the first to bring their EV/PHEV's to Central Florida. Our first event will be when Nissan brings the Leaf to Orlando on Feb 1-2...it's all very exciting stuff and the team is focused and engaged. This week, I'll be in Miami meeting with Charles Whalen, who is the Director of EV Infrastructure for the Florida Electric Auto Association and visiting Ted Scholz, the G.M. for the new Tesla dealership that just opened on 12/18/09. I simply can't wait to get behind the wheel of such a cutting edge car...assuming I can fit inside it. I've driven a Lotus Elise before and I needed a shoe-horn to get my 6'2" body in the drivers seat. I have a feeling that this year is going to be fun!